Wine boxes are made out of cardboard, so they are recyclable. Find out how to recycle cardboard. The plastic pouch is not recyclable, so remove it first and throw it away. Vacuum-sealed bags prevent oxidation from spoiling boxed wine, so boxed wine can last up to a month or more once it’s been opened. Avoid throwing away leftover boxed wine right away. The manufacturing process for boxed wine demands fewer resources. 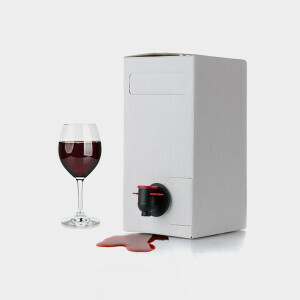 Boxed wine weighs less than bottles full of wine, so shipping has a substantially smaller carbon footprint. Read more on the argument for why Americans should join the Australians and French in embracing boxed wine. Restaurants prefer boxed wine for a number of reasons: not only is it easier to store, but there are more glasses of wine in a box than a bottle. Boxed wine giant Franzia reported that in 2007, more than 88 million glasses of its wine were served in American restaurants.